Will New Intel Processors Spark the Desktop PC Market? This year’s Game Developers Conference, which took place from March 17th to March 21st 2014 brought on a slew of exciting announcements from Intel. The tech giant is going to make a concerted effort to revive a segment of the market that was comparatively neglected in 2013: the die-hard PC fanatics. 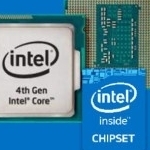 At the event, Intel representatives announced the release of not one but four new processors. All of the processors cater to different market niches. There’s the Haswell-E, the first Intel 8-core desktop processor, the 5th gen unlocked Broadwell with Iris Pro Graphics, a CPU codenamed ‘Devil’s Canyon’ and the Intel Pentium Anniversary Edition. In what follows, we’ll be taking a closer look at the last two of these four Intel processors, since their high-end performance and expected low-end price tags make them likely candidates to reinvigorate the desktop PC market. ‘Devil’s Canyon’ is quite an awe-inspiring name for a chipset. I think many people will be interested to learn if the processor lives up to its name. It is based on the Haswell architecture and promises several improvements to users who are interested in overclocking. For one thing, the thermal interface (TIM) will be enhanced in comparison with previous versions. Word through the tech ‘grapevine’ is that Intel is finally abandoning thermal paste in favor of solder as TIM; thermal paste can cause serious problems for overclockers since it allows heat to dissipate whereas solder performs better under overclocking while air cooling a cpu. Like the upcoming Broadwell processor expected in 2015, Devil’s Canyon will also support Series 9 chipsets from Intel. At the time this article was written, it was unclear whether Devil’s Canyon will use Z87 boards, or newer ones only which makes these newer boards ‘eligible’ for Broadwell upgrades. As reported by Extreme Tech, rumor has it that the new desktop Haswells will only provide a small upgrade in terms of speed – somewhere along the lines of 100-200MHz. However, the big news is the ability for them to be overclocked. Further details of this CPU’s expected performance are not yet known, but the whole world will find out all about it on June 2nd, its recently announced release date. At about the same time as Devil’s Canyon, Intel will release the Pentium Anniversary Edition processor. This Intel processor marks the company’s two decades on the market. It’s still unclear whether or not the two processors will be released on the same day. Some rumors suggest that they might both feature the new and improved TIM which was already confirmed for Devil’s Canyon. The major news about this CPU is that it will come with unlocked multipliers, which lends it the suffix ‘k’. What this means, for newbie desktop PC enthusiasts, is that the processor will allow users to overclock the processor by giving us the option to increase the frequency of the core and memory independently from the system. As previously hinted at by Intel, the CPU will support both Series 8 and Series 9 motherboards. It will be based on the 22nm Intel Haswell Refresh Architecture and will be compatible with the LGA 115x socket. Another interesting feature to be added to the Intel Pentium Anniversary edition is Quick Sync Video. Like the unlocked multipliers, this enhancement is probably part of Intel’s efforts to regain the market share of low-end gaming PC’s where its competitor, AMD, has been so successful. Some of the more seasoned overclockers see some potential in this move: back in the day, low-end CPUs came with great overclocking abilities. The unlocked nature of these CPUs allowed people with a small budget to create PC’s that could compete with higher end processors. Since Intel is now releasing this processor, it will likely become a good option again for a segment of the market that’s interested in buying an Intel Pentium for $100 or less. None of the four upcoming processors have had their definitive prices specified yet. However, rumors reported by WCCFTech claim Pentium might toss the Intel Pentium Anniversary Edition into a segment of the market that is currently occupied by AMD. Sources inside Intel that wanted to preserve their anonymity have stated that this processor is targeted at budget enthusiasts who want good power, good speed, and good overclocking abilities at low prices. My name is Andrew Buckmaster. I am a site manager for an online business consultation firm. I love to read and write about technology. I also love building PC’s and gaming. Although I am partial to AMD processors, I hope these new Intel CPUs will provide the ‘Kick-in-the-Pants’ AMD needs to produce another quality product. I may be a relative newcomer to the blog scene, but I have been writing and editing for years. In the past, I worked for a publishing company where I edited manuscripts. I currently live in Lancaster, PA with my wife and dog. I also run a blog called http://www.burnworld.com/. My site specializes in Blu-Ray/DVD burning, memory backup, and general technology. When I’m not blogging or working, I enjoy producing electronic music and hanging out with friends. Yea.Lets talk about Intel & that capitalistic company.Explain why Intel pays motherboard companies under the table to promote,distribute & design motherboards to accept there junk?AMD sure don't.WTF makes you think Intel is gonna"Save The Desktop World"? ?They can't even sell there own junk motherboards! !Intel has been nothing but a disgrace for the past 7-10 years.The biggest question on my mind & other AMD users is why hasn't there been an AMD based board that can handle 6-8 DDR3 Ram slots?Intel would literally get there a–es beat if an AMD based board had 6-8 ram slots & they know it.Why is it that since I have switched over from back in the day(P4 to A8)that I haven't received 1 virus running AMD based boards? ?Explain that 1 almighty Intel!Explain to me why I had no other choice but to buy Antivirus software every year because of Intel's junk.I'll NEVER go back to Intel if it was the last CPU company on earth.Intel can spit out CPU's all day long.For all I care,they can sit on the shelf & collect dust.They'll never get my business again.